I Can’t Believe I’m Even Writing This. On November 1st, I was on my way home from a relaxing and fun mountain trip in West Virginia with my sisters. I was flying solo- my first trip with all four of my kids long-distance and first time driving in the mountains. I had five hours behind me, an hour still ahead of me. Staying up until 2:30 that morning, coupled with time change (I got an extra hour of exhaustion. that’s it.) and a morning wake up call just over three hours later had finally hit me. It was dark (no thanks to the time change) and pouring, the baby was getting hungry and I needed reinforcements. I started scanning exits for that glorious white and green sign. There it was. Exit 141- Starbucks. I exited the highway and prayed it had a drive-thru. “Thank you, God!” I said out loud when I saw that it did. I placed my order for my Tall Upside Down With Whip Caramel Macchiato (yes, it’s a thing), and suddenly realized what day it was. The day after Halloween. November 1st. Brand new excitement hit me. IT’S RED CUP DAY!!!!!! I may or may not have clapped my hands and squealed when I saw my red cup sitting on the counter when I pulled up to the window. It symbolized the start of Christmas for me- my very favorite time of the year. And I’m quite certain coffee tastes better from those cups. 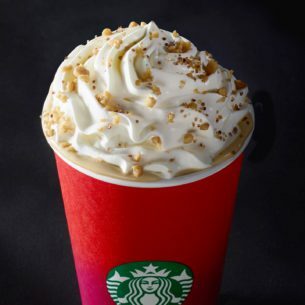 Fast forward a week and suddenly there is an outrage over the red cup all over the Internet. Something about how because the words “Merry Christmas” or whatever isn’t on it, it’s a war on Christians and infringes on their religious liberties. I’m sorry. WHAT. You got that from a plain red cup? I’m sitting here with butterflies and dreaming of trips to Target, sipping from my red cup while I sloooooowly peruse the aisles for Christmas gifts, and you’re declaring war on Starbucks? Last time I checked, Starbucks was not a Christian restaurant chain. In fact, Starbucks gives money to plenty of organizations that many would consider non-Christian. I don’t go to Starbucks to learn about Jesus. I go to Starbucks for coffee. That’s it! Whether it’s the drive-thru on a long trip home, a morning meeting with a good friend to catch up, or an evening with the other ladies from my accountability group… I’m there for coffee. Meanwhile, there are Christians who are actually being beheaded in other countries for their faith. That is a big deal. Try telling their families about how persecuted you are by a red cup. Or actually, don’t. Christians, please don’t tell the Barista that your name is Merry Christmas just to force them to write it on their cup and call it out to find you. Don’t demand your own way. Don’t force your beliefs on Starbucks. If my memory serves me correctly, most Christians were outraged when a gay couple sued a Christian run bakery because they wouldn’t bake a cake for their marriage because it went against the bakery owners’ beliefs. The same goes for this- do not force Starbucks or its baristas to Christian-esque your red cup. Their job is to make your cup of coffee delicious. And to remake it for free if you don’t like it. That’s it. Here’s a thought: if you don’t like Starbucks, or their horribly offensive red cups (insert eye roll here), THEN DON’T GO TO STARBUCKS. Likewise, if you don’t like a cake bakery, don’t order your cake from them. It’s that simple. This red cup thing is a little bit like “crying wolf”. When there is an actual attack on Christianity, no one is going to take you seriously. I have gone to Starbucks for years. I don’t go too often because it’s expensive and not really in my budget. But it has been a life saver to this mom of four who runs on little sleep and spreads herself thin daily. I have met friends for accountability group there, prayed with my friends there, sat in a corner and read my Bible there. Not once has my group been asked to stop praying or leave. Not once have I been asked to not read my Bible there. The only reason I have ever been (gently) asked to leave Starbucks is because it was closing time and I have a habit of wearing out my welcome. Sometimes I do tell them to write a name on my cup that isn’t my real name. But anyone who has ever gone out with me knows I love telling people my name is Cinderella. I digress. I’m a black and white person… I don’t see both sides of this. This red cup “issue” is so stupid. This isn’t even making a mountain out of a mole hill (southern saying for you northerners). There is no mole hill! There is nothing! It is a red. cup. Period. This is why people think Christians are crazy. If you are reading this and are one of those who is thinking that- I profusely apologize for this ridiculous spectacle. Granted- if Starbucks ever asks me to leave because I’m praying or to put my Bible away- that’s an entirely different thing. But since I have always been welcome to read or pray at Starbucks, you will probably find me more often than not with a red cup in hand, moseying through Target (read: chasing my kids and threatening to take stickers off their Happy Heart Charts if they don’t obey Mommy RIGHTTHISINSTANT!!! )… or enjoying it in my car while my four monkeys are all strapped down in seat belts and the DVD player is on. Now, can we all just move along to the more important things. Like inventing a machine that folds laundry for you. < Previous Welcome To My Trench. Next > With All My Love Always. well, you have a point and I DID quit supporting Starbucks several years ago, mainly because I don’t want to support a business that is in your face anti-Christian but they do have their right and I respect that but doesn’t mean I need to support that. Now I know what I’m buying you for Christmas! Oh, Em. As usual, you are spot on. Thanks for making it simple.